He cut the very first rock and roll record. "Yes, it's true. Syd was timid and very quiet, but he always hinted at the fact that The Villagers were natural entertainers, and in retrospect, they could plant planets." Plant planets? "No, I'm sorry, they couldn't do that." Sweet violin, here I am. 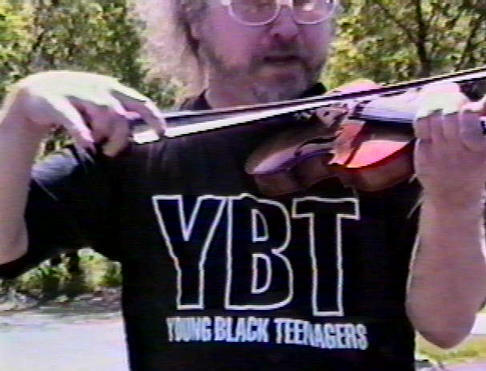 Sweet violin, here I am." And there he was, indeed. A passionate marriage with this fine lady was reduced only by his sudden reign over the songwriting and producing fields of the world's great recording industry. Sydney and Violin spanned the globe with uncanny perception and grace. Rock and roll in this rare new form began to thoroughly intellectualize thousands of communities, and the entire universe was at once gratified to be a little weird. People could talk and smile together, there gushed a creative optimism in everyday activities, and world leaders became magnificent artistes. Yes, love and happiness (were no longer sore thumbs).